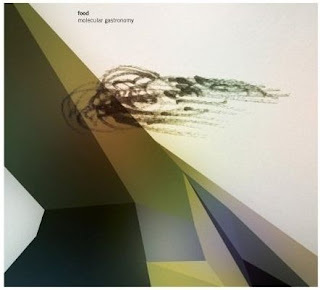 Recently, the improvisational electroacoustic jazz band Food released their fifth record named "molecular gastronomy"! Furthermore, seeing the track list, I was baffled by the rather specific concepts taken directly from molecular gastronomy (MG), such as khymos (Martin Lersch's blog), spherification and texturas (ref. the Texturas series by Ferran Adrià at el Bulli) and heston (Blumenthal, at The Fat Duck). At first, I wondered whether this was a joke, serious, or somewhere in between. Qualitywise, this is by no means a joke. Both from previous recordings and this one, Iain Ballamy (sax) and Thomas Strønen (drums/perc) prove that they are among the foremost in their field, no doubt. Other band constellations they are engaged in confirms this as well. So, is it possible to hear the gastronomy in the music? (ref. previous posts on food and chemistry/food vs. music). That's a difficult question, and I'm not sure whether I should look for it either. My experience with using other senses than my ears as impulse to improvisation is that things become rather banal if one lets the impulses become too evident in the music. One example when we (Quest) played together with the Norwegian poet and author Lars Amund Vaage reading his poems about sheep farmers from the book "Det andre rommet". The one percussion instrument to be extremely careful about in that context, at least in my opinion, was the (cow) bell. Anyway, I guess taste, aroma etc. are such unfamiliar impulses to use in music compared to visual (i.e. pictures) and text, that the effect of these may be difficult to discern (I'd really love to have a chat with the Food-guys about this). I'll surely spend time listening to this, food/gastronomy references or not. Strønen is no doubt a favourite in terms of combining energy, cool-factor and elegance. Coupled with the long mellow saxophone lines of Ballamy and keyboards/effects, the result is simply great music. After running the album a few more times, the question of hearing the food in the music is still a long shot to me. What is pretty clear, however, is that the music is closely connected to many of the track names; it's easy to relate/associate the music to the words. Examples are the machine like percussion (especially the bells) in "apparatus", the less rythmic and soft lines of "texturas", and the last track "alchemy" which is a synthesis (or maybe a distillate) of several of the other tracks. So, the search for food/gastronomy in music goes on, or maybe it's already there, the fault being in my mind or expectations? Cooking is a discipline that is often heavily focussed on a successful result. Sometimes this is a good thing, but other times focus on achieving is not necessarily the best strategy in terms of learning. In these cases, a science perspective may be just what is needed. In Norway, cooking in school has had a rather strong feminine focus, possibly because the approach has been home cooking and home related questions rather than a more masculine gastronomical /restaurant perspective. * This focus prevails, and I don't complain about that. On the contrary, I think a home focus is the right approach in a school setting. if the pupils/students end up with is a bread that hasn't leavened, would that be regarded as a failure? If the goal is achieving an optimal product, the answer is probably yes. If learning is the goal, I'd say no. In fact, it may be an excellent impetus to learn something about baking, yeast, leavening etc. In fact, nothing spurs me more to experiment than when a recipe tells me by all means to avoid doing something, such as getting egg yolk in when whipping egg whites, or whipping the double cream past the whipped cream-stage. Sometimes, "sabotage experiments" may very well be the ultimate way of learning and experimenting with food (and may result in surprisingly good or interesting products as well). Through science and research, we learn that a result is a result is a result...; a negative result may be as informative as a positive one. If it is true that "a drop of success will create a pound of persistence", then why not turn what could be seen as a failure into an interesting result from which one may learn from? Maybe this could spur towards a more gender neutral home economics (in Norway: Food&health) teaching? 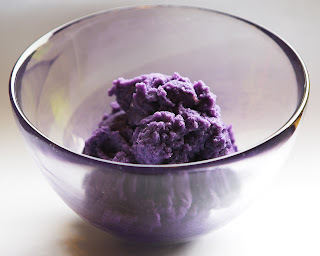 Also, in many cases the unlikely results and the odd combinations may be the ones that lead to new experiences and wonderful dishes, such as the unlikely purple mashed potatoes made by all blue potatoes (there are no colourings added and the picture is not manipulated). 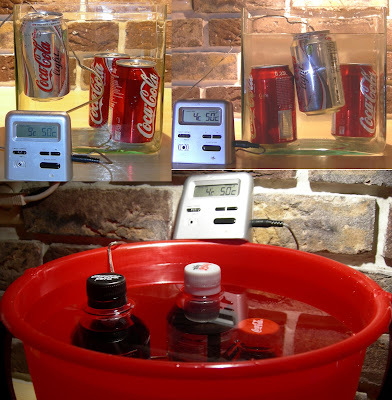 And, of course, the density-temperature difference should not be very different from water to Coke, so at temperatures of high water density, the same should apply to Coke. Experiments should always be tested for repeatability, so I used two cans of coke. Also, I tested whether the same would happen for Coke bottles (500 ml plastic bottles), and if the same would happen for Coke Zero. The pictures below tell the whole story. The difference between Coke Light and Coke Zero, from the ingredients list, seems to be the sweeteners. Coke Light contains Sucralose and Acesulfame K, while Coke Zero contains Aspartame and Acesulfame K.
What seems really strange to me is the measurement of Coke light and Coke Zero having densities lower than water, especially the light variety which is well below any temperature dependent variations. 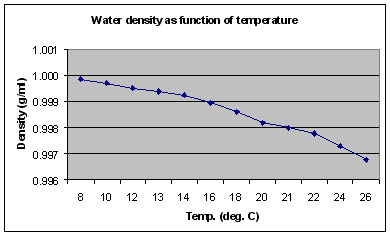 How can it be that a water solution with dissolved matter has lower density than water? Carbon dioxide? I don't think so. Carbon dioxide is still matter dissolved in water and should contribute to a higher density rather than lower (regardless of its density in pure, gaseous form). 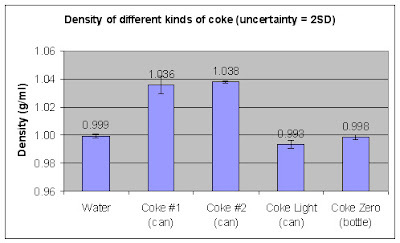 Anyway, the safe explanation to the floating Coke light is of course the air pocket (both in cans and bottles), and I think I'll stick to this as the main explanation rather than densities of Coke. Ordinary Coke is a clean cut case, anyway. Does "light" really mean light? In a simple demonstration playing around with light products floating/sinking in water a fascinating contrast emerges. Try submerging the following two pairs of products: ordinary and light mayonnaise, and diet coke (or other cola vs. cola light). Light mayonnaise floats lower than ordinary mayonnaise. In the case of the soft drink, cola light floats while ordinary cola sinks! What's going on? Fat floats in water. A larger proportion of fat makes the mixture closer to pure fat and vice versa. Cola can be considered as water with some dissolved material. Ordinary cola is, as such, a sugar solution with a few other additives (taste, aroma, colour etc.). Cola light contains the artificial sweeteners Sucralose and Acesulfame K. Both are far sweeter than table sugar, sucrose (650 times and 180-200 times, respectively, ref. Belitz). Thus, far less sweetener is needed. If we assume that all other ingredients are the same, then far less material is dissolved in the light version. The same total volume with less material --> lower density. 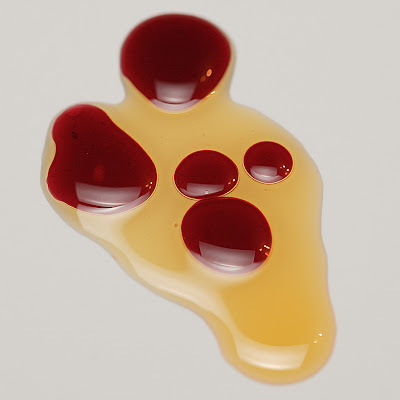 Thus: pure cola light would float up in ordinary cola taken that they didn't mix. 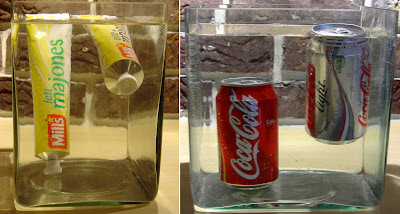 In both the mayo and cola cases, there is some air (or trapped gas) inside the tube/can. This makes the tube/can float higher than in the case of the pure mayo/cola. However, as long as the volumes are the same, this doesn't make any difference. If it wasn't for the air, both cans would in fact sink, and the experiment wouldn't be. The concepts relevant to this is not only "light", but also (amongst others) "(chemical/dietary) energy" and "density". If something floats, we usually say that it's "lighter than water". However, two kilograms of wood is heavier than one kilogram of water, but it still floats. To me as an adult, it's probably easy to grasp, but placing this in an educational context makes it important to use the correct terms. So, "cola has higher density than cola light" would be more correct. It's quite easy to put this to the test: measure both the volume and weight of a can/bottle of cola and compare. The one that sinks (highest density) weighs the most taken the same volume. Another version of this experiment is concealing the labels, letting the students know the content without telling which is which. The task is then to use knowledge and reasoning to deduce which is which. Using the term "diet" rather than "light" would of course make the whole case less diffuse, but then a fascinating aspect in the experiment and following discussion is lost. This is the reason for using "light" instead of "diet" in the first hand. However, this may be a nice way of introducing the energy concept of (chemical) energy, kcal and kJ, and contrast this against "light" used in different contexts. Natural sciences are evidently not only concerned with nature itself, but just as much the language describing nature.